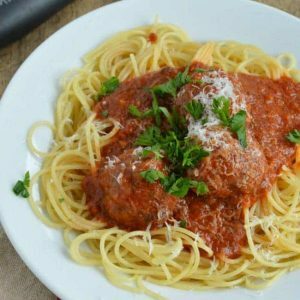 This Be All End All Slow Cooker Meatballs Recipe will change your meatball game in the best way! 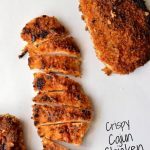 You can make these with chicken, beef, pork, or a blend. 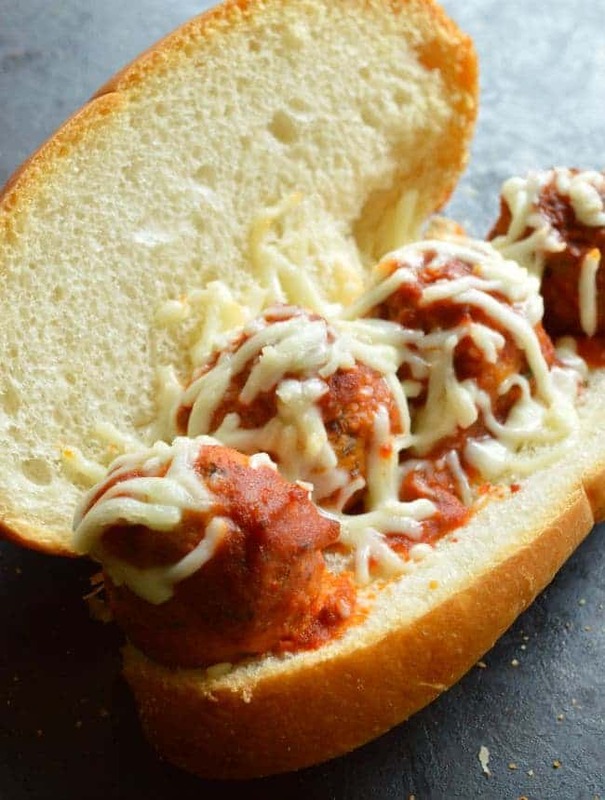 They are moist and full of flavor, make great sandwiches, and the best spaghetti! 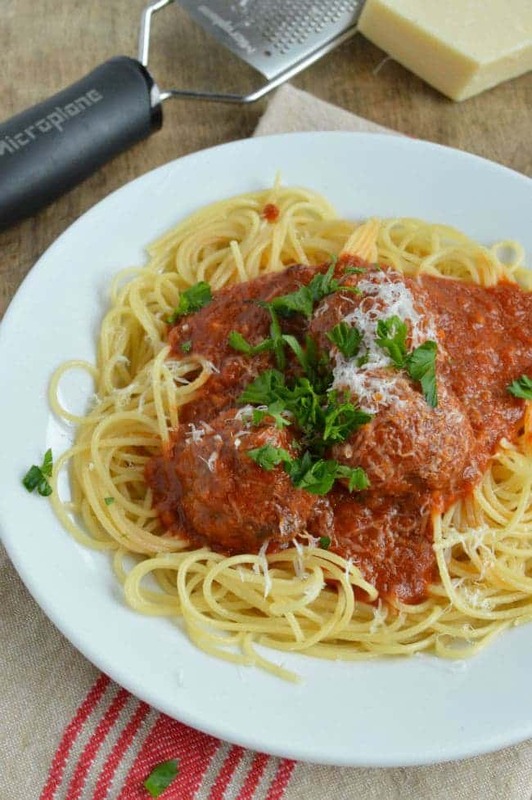 This meatball recipe is a game changer, ya’ll. Because ohhhhh how I love a good meatball. But I do not love cooking them. I’m not sure if it is just my own personal dysfunction or what, but I have a hard time browning things that lack actual sides. Please tell me you understand what I’m talking about. Normally when you make meatballs you have to mix them and then form them and then brown them in a skillet. AND THEN you have to cook them on the stove in sauce for awhile, making sure to stir sometimes so nothing burns. It’s this whole big ordeal that I don’t want to deal with if I want a meatball on say… a Thursday. So I solved the problem. 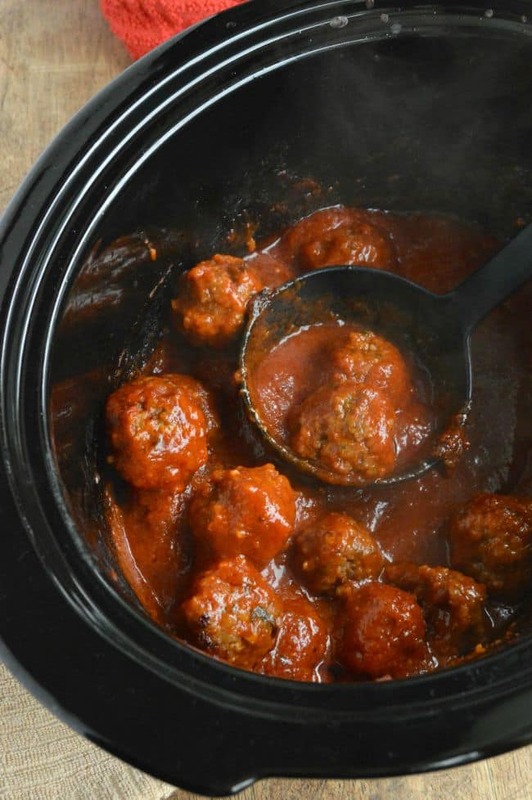 And I came up with an easy meatball recipe — you just mix ’em, roll ’em, throw ’em in the slow cooker and GO. No browning. No stirring. They are fabulous. I made them a couple of ways. First with ground chicken and then with a ground beef + Italian sausage blend. They were delicious both ways and the kiddos love them. The finished meatballs are saucy and moist, and I am all for letting my slow cooker do the work. In a large bowl use your hands to mix together the ground meat, minced garlic, salt, pepper, parsley, and breadcrumbs. You want to mix until combined but don't over work it. I like to leave a few breadcrumbs in the bottom of the bowl for easier rolling. Roll the mixture into balls - about the size of a golf ball, maybe just a little smaller. Pour the sauce into the slow cooker and add the meatballs. They will sort of sit on top of the sauce. Put the lid on the slow cooker and cook on high for 1½ hours or on low for 4 hours. Halfway through cooking remove the lid and sort of shake the slow cooker from side to side -- the meatballs will sink down and coat themselves in the sauce. Recover and let the slow cooker continue working. Serve on spaghetti, sandwiches, or in a bowl all covered with cheese. look and want to drool. very atractive. 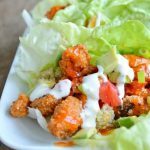 thanks fore share recipe! Haha — these are super easy & totally delicious. Dinner tomorrow, maybe? 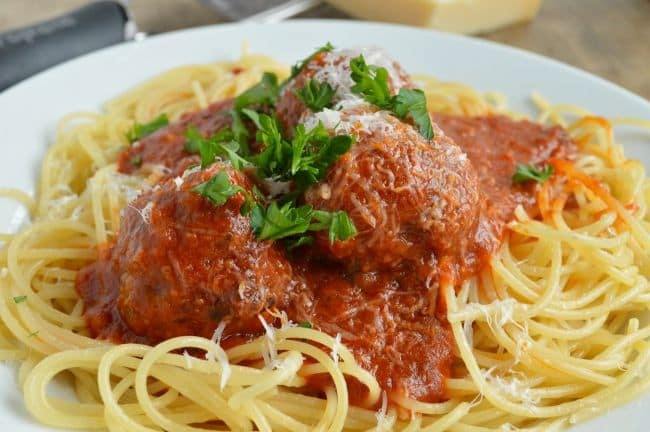 I am a crazy fan of meatballs, I can’t stop eating them :D. Your recipes is really cool, especially the picture, they make me hungry so much. What an awesome article, love it ! Am planning to make these for scout pasta dinner. Hi Laura! A standard sized jar of prepared sauce — usually about 32 ounces. Enjoy!!! 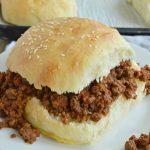 Can you use ground turkey and hamburger? I want to eat meatballs daily 🙂 Very delicious. 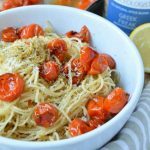 Thanks for sharing recipe! Aha!! Nice recipe. Delicious picture (of the top). Anyway, what kind of meat grinder did you use here? Is it 1 lb of each, chicken, pork and beef (total of 3 lbs of meat) OR 1 lb combined? Does not seem lije 1 lb combined would make 20 golf ball sized meatballs. Thanks!